The Sharps Disposal by Mail System, manufactured by Sharps Compliance, Inc., represents the first complete disposal system pioneered for simplified management of used needles, syringes and other small quantities of bio hazardous waste. Sharps Disposal by Mail System is the ideal disposal solution for medical waste discovered or generated by both facilities as well as individual patients who self-inject therapeutic drugs. 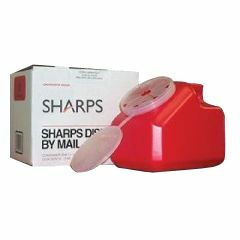 The Sharps Disposal by Mail System includes a sharps container, a government-approved return sharps mailback box, a protective 3-ml bag liner and a 4-part simplified tracking form. The cost of destruction and mailing, as well as confirmation of destruction, is included in the purchase price. When the sharps container is full, it is placed in the pre-paid postage return box, which is returned to Sharps treatment facility via the U.S. Postal Service (USPS). Upon receipt, Sharps documents the receipt, weight and destruction of each container and its contents of used syringes. Electronic proof of destruction is made available for your records. Reliable. Compact. Easy To Use. Accurate. We are in our late 70's a. We are in our late 70's a. We can no longer drive and the few times a year our county has for pick up with an appointment make it impossible for us to take our Sharps to the pick up center. This way we can mail it. Thank you so much. Fast shipment. Reliable. Compact. Easy To Use. Accurate. Daily Use. Disposal of needles. I got the 2 gallon one and it was the best price around compared to other companies who dispose the waste for you. I use this unit to put in my insulin pump needles and other sharps from my meter. I change my pod every three days and test around 5 times a day and it takes me about a year to fill this up. [...]It also does not take up a lot of space. I store mine on a windowsill in my kitchen. This product is exactly what I needed. Easy To Use. Reliable. Compact. I use the product to dispose of used syringes. It is great to be able to return it for disposal. Have not found anything not great about it. do i have to use a sharps diposl unit for the BD tips for victor pens? If I order one container and mail back to you at the one sale price, do you send me another without charge etc.